Martyred in 1170 when still the Archbishop of Canterbury, St. Thomas Becket was canonized only three years later, and became one of the most important religious figures in the history of the English church. In this work, Kay Slocum analyzes the image of Thomas Becket as presented in the liturgies composed in his honour, and examines these within the context of the political and social history of the late twelfth and early thirteenth centuries. 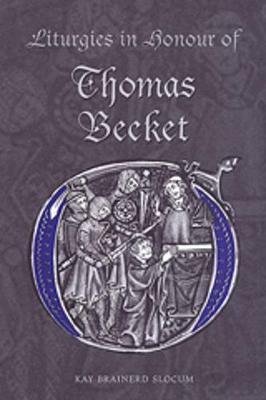 Through these liturgies, Thomas Becket is presented as 'novus homo', 'bonus pastor', a defender of the church, a martyr, a miracle worker, and a type of Christ. The first part of this book examines these images, and demonstrates how each is developed using material from Becket's contemporary biographers, and analyzing the historical and political context. The second half of this book presents musical transcriptions and English translations for two complete offices, one for Thomas Becket's feast day, and another for the commemoration of the translation of his remains. Drawing on literature, music, and liturgical texts, this interdisciplinary study illustrates how varied materials can be drawn together to enhance our understanding of medieval culture and society.